Geoffrey Mugasira thought his life was hopeless. With a family of five children and four adults and very little income, he could hardly afford school fees, medical bills, or quality nutritious food. His children were prone to malnutrition and infectious diseases. He had a small piece of land but was unable to use it solve his problems. Then Geoffrey learned about Samaritan’s Purse through a friend who used to attend our trainings on modern livestock rearing. 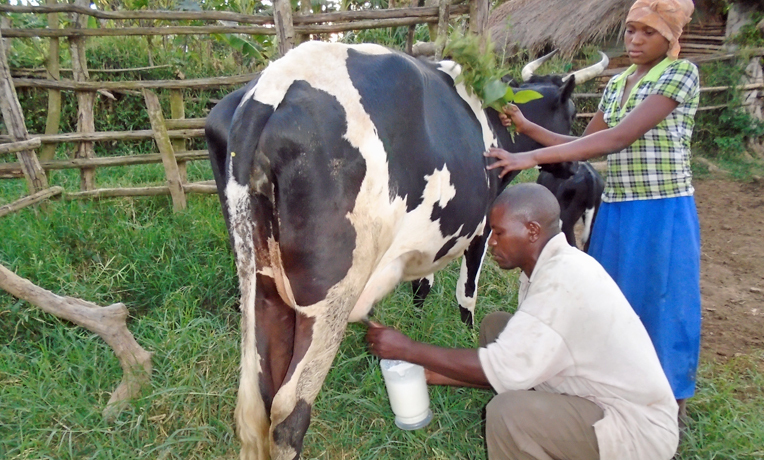 As part of the program, farmers also received a dairy cow from previous beneficiaries who are required to give some of the offspring to their neighbors. Geoffrey began to attend trainings regularly, mostly because he hoped to make money to buy more alcohol. But he had doubts. “I did not believe an expensive Friesian cow (a modern, high-production dairy cow, superior to the indigenous varieties that yield much smaller quantities of milk) could be given out to me,” Geoffrey said. He began to see that there might just be something different about these people who said they worked in the Name of Jesus when he was selected to receive a pregnant heifer. With the skills acquired through the training sessions, he put up two acres of pastures for feeding the cow, made an earthen dam to store water for the animal, and constructed a modern cowshed with a milking area and a calf pen. Samaritan’s Purse staff members did more than promise him a cow and teach him how to care for it. They also ministered to him one-on-one, telling him about the Savior who came to provide forgiveness for his sins and power to live a transformed life. Geoffrey came to faith in Jesus, and decided to devote his life to Christ. The heifer he received bore a female calf in December 2007. By August 2009, the calf had reached reproductive age and was passed on to another beneficiary as agreed upon during the training. Currently Geoffrey has three productive cows, and he has sold two bulls. This year, Samaritan’s Purse has helped the dairy farmers set up a cooler so they can refrigerate the milk and sell it at higher prices to bulk buyers. The impact in his life is far-reaching. His children now get nutrition and protein from milk, and aren’t sick as often. He can pay school fees, medical bills, and household utilities. Thanks to the income generated by the sale of milk, he can afford other foodstuffs like rice, eggs, and meat. Geoffrey also saves money in a village saving and loan association as an investment in his family’s future. He has been able to improve his banana plantation by using his cattle’s manure as compost, and he has learned how to rear dairy cows as a business, utilizing the techniques for the construction of livestock structures, pasture management, and disease control. Through much hard work and support from Samaritan’s Purse, Geoffrey now earns 4,500,000 Ugandan shillings (approximately $1,800) per year, a huge change for a man who just a few years ago made 600,000 Ugandan shillings (US $240) in a year. Most importantly, Geoffrey now serves God and shares the Good News of Jesus Christ with others. He became a pastor at a local church. He has a peaceful and happy life with his wife and children.